McDaniel said the proposal came at the request of Bevin's administration. 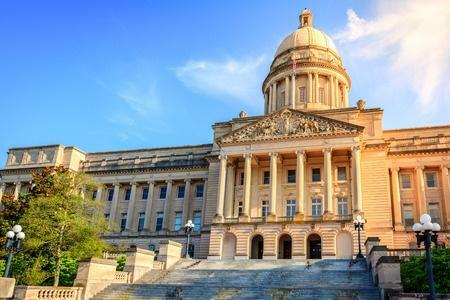 On the last day of the legislative session, Kentucky lawmakers are advancing new tax breaks that would benefit companies that are spread across multiple states and countries. The measure allows multi-state companies that are now required to use "mandatory combined reporting"— a change to the tax code enacted by state lawmakers last year — to spread their financial losses evenly across their various affiliates, a financial benefit to the companies. The proposed changes comes after lawmakers approved — and Gov. Matt Bevin signed into law — a tax bill that would reduce state revenue by about $106 million per year, largely by tweaking the way banks get taxed. Sen. Chris McDaniel, the Republican chair of the Senate Appropriations and Revenue Committee, said that he doesn’t know how much the new changes would reduce state revenue, except that "it would be a negative." "It probably will have some degree of an impact. Unfortunately, where the impact really occurs is mainly related to the mandatory combined reporting, which we don't have data on at this point. So it's strictly an economist's guess as to what that will be as it goes forward," McDaniel said. The measure passed out of the committee on Thursday and will have to pass out of the full Senate and House before Bevin can consider signing it into law. The tax changes come as Kentucky struggles with a $37 billion pension debt and the state is already expected to be short about $22 million of initial projections when the fiscal year ends on June 30. Lawmakers are also considering House Bill 358, a measure that would allow regional universities and some state agencies to exit the pension system — a proposal that would increase the state's pension debt by at least $1 billion. When the Kentucky Coalition Against Domestic Violence joined the state's pension system in the early 2000s, it had to set aside roughly 6 percent of each employee's salary for the retirement plan. Gov. Matt Bevin says he will likely sign off on a tax bill that reduces state revenue by about $105 million per year. The changes are mostly due to an adjustment in the way local banks get taxed by the state, but also include several other tax breaks.